Is Udemy Worth It For Instructors? Udemy is an online course marketplace with over 24 million students and 80,000 courses. It's an awesome place for students. But is it a good place to create and sell your own courses? Is Udemy worth it for instructors? Udemy can be a good place for new instructors to learn how to create and sell online courses. Their free hosting makes it easy to make your course available without having to pay for your own platform and do your own marketing. If you're serious about selling online courses though, you probably won't want to stay on Udemy. They take a large commission for generating sales and there are limitations they put on your pricing. In this article, you'll learn if Udemy is worth it, how much instructors can make, and some reasons why Udemy might not be the best place to sell your course in the long term. I think Udemy can be a good place to start if you're just trying to create an online course for the first time and have no existing audience to market it to. They provide some support, and you can leverage their access to millions of existing students to help make some quick sales. Their insights tool helps you to identify what's working best and their regular sales and promotions will bring you students without having to do all the marketing yourself. However, once you've established yourself as a course creator and gained some experience, or if you already have an existing audience you can sell your courses to, then I think there are better platforms and options available. I'll discuss my reasoning for this in a little bit. Udemy instructors can make anywhere from $0 – $100,000+ per year by selling their courses on the platform. Author Jessica Brody earns between $1,500 and $3,000 each month from selling five courses on Udemy teaching people how to write. And the top Udemy instructors have earned millions of dollars with courses teaching in demand topics like web development. Like most businesses though, you get back as much as you put in. If you're consistent about producing high-quality courses and you put in the time and effort to help market them, then your chance of making a decent income from selling on Udemy is pretty good. However, you should take the time to research the topic you want to teach and try to find an under-served niche on the platform to avoid competing with lots of other similar courses. If your course ends up on page 10 of search results for a hot topic, your visibility will be extremely low and you'll be lucky to make any sales. It often seems like the first courses that make it to market on a specific topic have the best chance of success, and it can be harder for latecomers to enter the market. There seems to be a big gap in how much the most successful instructors on Udemy make compared to the average instructor. For example, the top Photoshop course on Udemy makes about $8,000 per month. While the median revenue per month for a Photoshop course is only $34 (source)! What Is Udemy's Pay Structure? The revenue share you get as an instructor depends on how students find your course. The good news is that there is no cost to create and host your own course on Udemy. You can make as many paid and free courses as you want and, if you do your own marketing, the commission you pay can be as low as just 3% per sale. The bad news is that if you don't generate the sale yourself, Udemy and other 3rd parties can take a pretty significant chunk of the sale: as much as 50% to 80%! If traffic comes to your course organically through Udemy or search engines without a coupon, you 50% if the revenue. On top of that, for sales in the Udemy Android and iOS apps you'll lose an additional 30% fee to Google or Apple from the total sale price! Udemy will sometimes also promote courses for free. If you're included in their Udemy Marketing Boost program, they pay to advertise your course but you'll only get 25% of the revenue from course sales. The other 75% goes to Udemy and to pay for advertising costs. The way to make real money on Udemy is to bring your own traffic to your courses. This way you'll get a 97% share of the revenue, only paying a small 3% administrative and processing fee to Udemy. 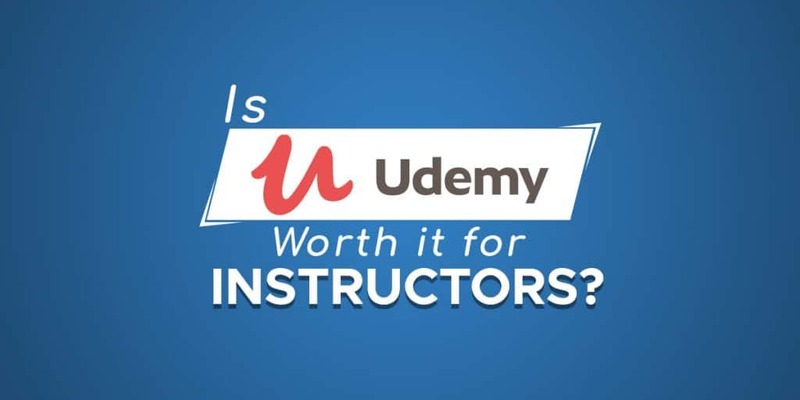 Because of this, creating instructor coupons is a crucial part of selling courses on Udemy. The only way to qualify for the 97% revenue share on sales is if your course is purchased using a coupon code that you generated and promoted to someone who then enrolled. This is one of the main downsides to selling courses on Udemy. You'll need to do your own promotion and marketing to make a significant profit, especially given the restrictions on the sale price of your courses (see below). If you've already got an online audience of some sort on Youtube, Instagram, your own website or even in real life(!) then making a course on Udemy could be worthwhile – although you’ll make more income if you set it up on your own online course platform instead. If you don't already have an audience, then you’ll need to put in the effort to promote your courses on Udemy, otherwise it can be difficult to make sales except at a 50-80% revenue share. Can I Control My Course Price On Udemy? You can set your course price on Udemy anywhere between $20 and $200, but only in increments of $5 at a time (source). For example, $30, $35, $40, etc. Here we come to another major downside of the Udemy platform. It limits the price point for your courses. When you combine these pricing restrictions with the low revenue share percentages on organic sales, you'd need to sell thousands of courses in a year to make any kind of decent income. Also, you should take into account that Udemy often runs heavily discounted sales and promotions as a key element of it’s marketing strategy, offering all courses at $10 for a limited time, for example. Though you can opt out of these, this is where Udemy is most likely to promote and market your course heavily so if you want to gain traction on the platform it’s expected that you take part in these. There's a lot of factors that will determine how successful your online course will be, whether it's on Udemy or another platform. This sounds like a weird suggestion, but think about it. Why not learn about making and selling Udemy courses from someone who is already an expert at it? That will save you tons of effort learning how to do it yourself. There are plenty of courses on this topic available on Udemy, and plenty of good ones are on sale for only $10 at any given time. So you might even want to buy a couple and learn some tips and tricks before trying to create a course on Udemy by yourself. If there's a course very similar to the one you want to create, buy it and watch it. Grab some blank paper and a pen and take notes. What do you like about the course and what don't you like? What areas could you improve the course or add extra information? Keep all these tips and use them to build a better version of the top course in your topic area. Udemy gives you a free tool called Insights when you sign up to be an instructor. You can search any topic you might want to make a course about, and it will give you detailed statistics about how in demand that subject is, how many other courses already exist on the topic, and other valuable insights. It even shows you the median monthly revenue and top earner for a particular topic so you can get a pretty good idea about how much you'll earn. Udemy can bring great exposure and help you to build a name or brand. But there’s no reason why should just sell courses there. One really good strategy is to make shorter courses on Udemy to generate an audience, and then sell more in-depth courses on your own platform using either Teachable or Kajabi. For more info on this idea, check out this post from Thinkific. Udemy could be a great place to get started if you're new to creating online courses. But their pay structure, low price point and heavy discounting mean you'd need to sell thousands of courses per year to make a significant amount of income. If you're serious about creating online courses, I think there are plenty of other options where you get to keep a much higher percentage of the revenue and have total control over your pricing and course content. Creating your own platform would be ideal, but there are other Udemy alternatives which offer a better revenue share than Udemy. The only way to get a 97% revenue share on Udemy is if you do a lot of leg work promoting and marketing your courses. But if you’re doing this, then you may as well do it on your own platform and set a higher price. Personally, I think Udemy cam be good to get started with, but you should always have in mind that you will transition to your own platform and start building your own brand and making more in depth courses in the long run. Does Udemy Have Any Minimum Course Standards? Yes. Udemy reviews every course published on their platform to make sure they meet their quality standards. Courses need to contain at least 30 minutes of material. This should include at least 5 separate lectures comprised of valuable educational content. All video used in courses must be HD quality, so 720p or 1080p. No. When someone buys access to your course on Udemy, they never expire or have any kind of time limit. Students will have access to it as long as the Udemy platform is still online.